Syrian media report attack on territory with known Iranian presence. The air force of Syrian President Bashar al-Assad repelled an attack by "hostile forces" in southern Syria Thursday evening, government media outlets reported. The attack allegedly in Al-Kiswa south of Damascus, which has been attacked several times in the past and has an Iranian military presence. 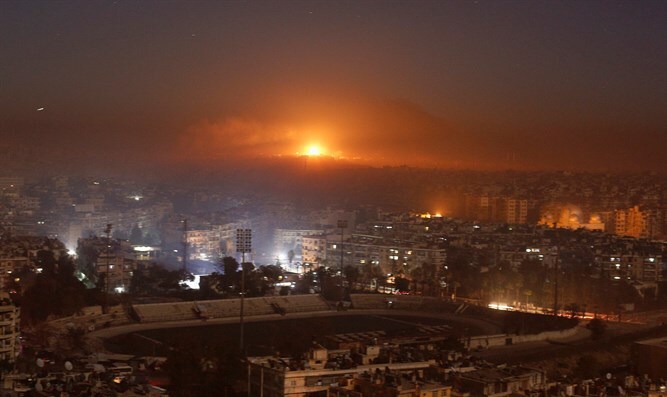 According to one report, the air defense forces attacked a "foreign body" in the Damascus capital. According to the Saudi based Al-Arabiya news station, the targets of the attacks were the warehouses and headquarters of the Iranian militias in the area. The incident comes several hours after an Iranian cargo plane packed with Iranian weapons destined for Hezbollah flew directly from Tehran to Beirut's Rafic Hariri Airport. The IDF Spokesperson's Unit said that a missile was fired at an open area in the Golan Heights, and that IDF forces were searching the area. The IDF denied Syrian reports that Israeli aircraft or an Israeli target had been hit.